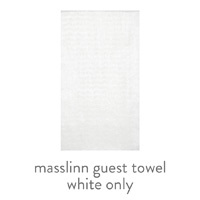 Masslinn napkins and guest towels are what we refer to as our country club napkin. 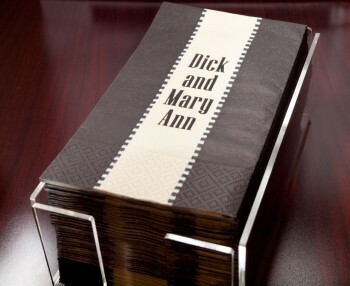 Made from 100% rayon fibers these napkins are extremely soft and luxurious. 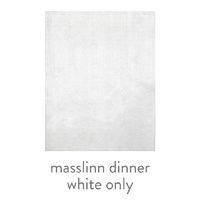 Masslinn napkins are perfect for powder rooms and private clubs requiring only the best. They have made appearances at large well-known events such as The Masters and the Kentucky Derby in upscale designer portable restrooms that are decked to fit the theme. Due to the nature of the fiber these are only available imprinted in gold, silver, or copper metallic foil inks. 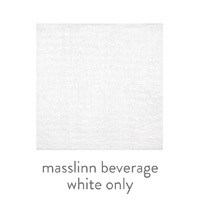 Personalized Masslinn Napkins and Guest Towels are available in 4 sizes (beverage/cocktail, luncheon, dinner and guest towel) in white only with low minimums starting at quantities of 50. 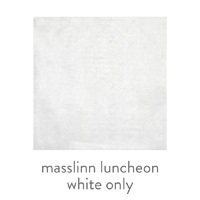 MBW Beverage 4.75" 4.75" 3.50" x 2.50"
MLW Luncheon 6.50" 6.50" 3.50" x 2.50"
MTW Towel 4.50" 8.00" 3.25" x 2.50"
MDW Dinner 6.5" 8.25" 4.75" x 2.50"